“Here we have my roland SVP 355 pitch – volt converter synth. This will convert any incoming audio into a synthesised tone and also allow you to run the dry signal through the resonant filter alongside the onboard oscillators. You can also run it from CV/Gate ports on the back. These things are getting rarer and often you only see them on import. ` “Roland PVS-355 is a true Pitch to Voltage synthesizer with full Controlled Voltage inputs and effects sends. It’s dual purpose allows you to use a guitar or voice or other monophonic pitched instruments as an input or as a stand alone synthesizer or an expander for a Eurorack synthesizer system. The synth creates an envelope and pitch to follow the input and the two signals can then be mixed. Dual Oscillators PLUS Sub Osc, VCA, VCF, envelope generator, envelope follower and Portamento. “You’re looking at a 1979 Vintage Roland SPV-355 Analogue Pitch to Voltage Synthesiser module in pristine original condition! Original UK/Euro power version, no transformer needed. Super fat and organic dual VCO’s, 24db VCF..basically the same architecture as the Jupiter 4 and Roland ProMars monosynth. Feed vocals, other synths, guitars into it for instant satifaction..or simply control via CV/Gate etc… a fun an truly inspirational rack synth that sounds phenomenal! “Exakt dieses Gerät wurde in der April Ausgabe von Sound & Recording getestet und vorgestellt. Bei Bedarf kann ich das Pdf des Artikels zusenden. RARE ITEM! Collectors Alert! Collectors Alert! Collectors Alert! THIS UNIT IS IN AUSTRALIA VOLTAGE! 240V! EXTREMELY RARE SINCE MOST OF THE ONES ON THE MARKET ARE 110V AND REQUIRE A STEPDOWN TRANSFORMER! “Overall, the synth is in excellent working condition.All sliders run smoothly and are crackle free. Cosmetic condition is very good. The front panel is clean and nearly mark free, with only a couple of minor marks. Rack handles are good with minor wear only. Side and back panels have a little marking. Top panel has a number of fine marks where its has been racked as you would expect but nothing major (no dents, deep scratches). All knobs, switches, sliders and slider caps are present, original and function correctly. This is a 100v model so is sold with a step down transformer” Auction ended. Click here to browse on eBay. Voltage: 110VAC (USA/Japanese plug fitted) Step down transformer required. Condition: Excellent. Very clean unit, suit collector, no rack rash, very nice face plate. Would be hard to find better. Small area of paint missing on top, see pics (not visible if rack mounted). It is really fun for experimenting with, especially when bringing together other synths, drum machines, mics, analog sequencers etc !!! A rare unit. Plenty of info on the net. 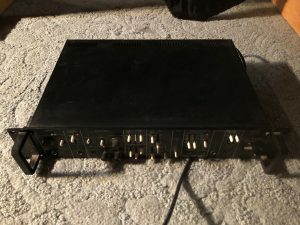 It is an analog synth which can also convert voice, guitar, monophonic instruments, other synths, etc into a CV voltage to control its internal synth and can also trigger other external synths at the same time, making it quite versatile especially with vintage synth setups.” Auction ended. Click here to browse on eBay. Schöner alter analoger Synthesizer aus dem Hause Roland. Er klingt älter & fetter als die SH-101. Eigendlich ein Gitarren-Synthesizer, d.h. Klampfe rein und der Synthie folgt der Tonhöhe der Gitarre.Man kann natürlich auch einen Drumcomputer, andere Synthesizer, Stimme ,… anlegen , und man erhält sehr abgefahrene Sounds. Oder man triggert ihn mit einem Sequencer. Dafür hat er hinten CV/Gate in und outs. Zusätlich hat er einen CV VCF in , damit wird es richtig gut !! 100Volt Version – ohne Spannungswandler. Läuft auch mit 110V. 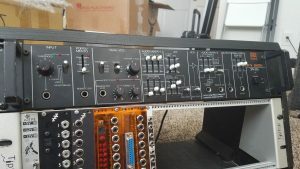 Fine working Vintage roland SPV-355 Synthesizer with CV VCF-in mod.” Auction ended. Click here to browse on eBay. Schöner alter analoger Synthesizer aus dem Hause Roland. 100Volt Version – ohne Spannungswandler.” Auction ended. Click here to browse on eBay. “SUPER COOL AND HARD TO FIND ROLAND SPV – 355 P/V SYNTH. ITS A TWO RACK SPACE UNIT THAT IS PITCH TO VOLTAGE FEATURING X2 VCOs, A SUB OSCILLATOR, VCF, VCA,AND A ENVELOPE GENERATOR”……SO BASICALLY YOU CAN PLUG ANY 1/4 SOURCE INTO IT, OR REAMP ANY SOURCE INTO IT. NEEDS TO BE SINGLE NOTE STUFF… GUITAR, BASS, VOCAL, WOODWINDS, DRUMS ETC ETC….PRETTY MUCH THE ONLY REAL ANALOG SYNTH MODULE THAT DOES THIS. LATE 70’S ROLAND ANALOG SYNTHNESS….I WAS TOLD ITS LIKE A MONO CHANNEL FROM A SYSTEM 100…..C/V OUT IS REAL FUN….HAS THE D.I. SIGNAL AND THE MODULE SIGNAL SO YOU CAN BLEND THE 2 AS YOU LIKE….” Auction ended. Click here to browse on eBay. “Up for sale my Roland SPV-355 P/V Synthesizer (serial no. 911215). This thing is great! One of the best racksynths I ever had with CV/GATE in and out. I used it in my (non-smoking) homestudio. The synthesizer is in very good condition! Optical it is like new. You won’t find any scratch on the panel. Only on the bottom there are some minor scratches. Is is in original condition as you can see on the photo’s. Three sliders will crackle a little bit when you move them, but overall it’s in good working order. ” Auction ended. Click here to browse on eBay. 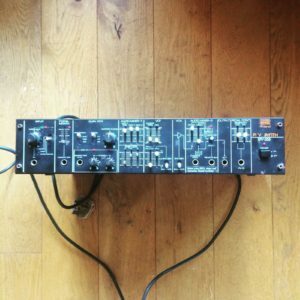 “Today I am auctioning off my brilliant Roland SPV-355 rackmount monophonic analog synth. It’s hard to describe it’s sound, although one could compare it to the early versions of the Jupiter 4 and the Promars. It uses discrete VCOs and the early SH-design filters. If you’re looking for Roland arpeggios, basslines and leads THIS is the synth for you (the envelopes are ridiculously fast). It has a great big thick sound since it uses two vcos in addition to one sub oscillator. It’s a bit modular in nature as you can patch a lot of stuff into the front to control the vcos and the vcf. It has CV/Gate inputs located on the back. You would control this either via another analog synth, midi-to-cv box, or via silent way/volta with your computer. It looks wonderful with a little bit of rack rack around the holes but oddly enough, nearly spotless everywhere else. It works great and sounds even better! There is one caveat. This synth was made for guitarists to plug into and the synth was intended to track the pitch of the guitar and play along with it. This was a big thing in the late 70’s, and to me kind of goofy. Isn’t the nice thing about guitars the ability to play chords, which this synth and all the other ones designed at the time unable to do? At any rate, this ability doesn’t work (or maybe I don’t know how to use it). It passes audio through the synth but doesn’t track it. I don’t know. I’ve treated it as a rackmount analog synth and cannot guarantee functionality of this strange guitar part of the synth. At any rate, grab this and you’re in 70’s Roland analog synth heaven! Shipping is 25 dollars. Good luck and happy bidding!” Auction ended. Click here to browse on eBay.